We all love to decorate our homes to reflect our personal tastes. From those who like to go minimal to those that prefer a more traditional look, getting the decor you want is key to feeling at home. Did you know that how you decorate your house is also important for other reasons? One way it does this is to improve and enhance the overall feel and atmosphere within the living spaces. Of course, we all want to spend time in a house or apartment that makes us feel good and that also provides a secure place for our families and an attractive place for our friends to visit. By thinking about that when you decorate your home you can ensure that what you do will have a positive effect and create an overall improvement. How does your décor lift the atmosphere in your home? 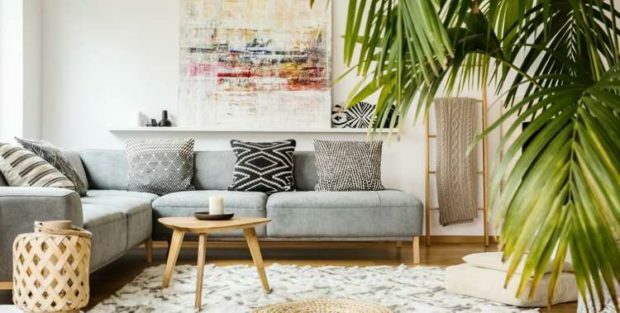 It might be hard to connect your home decor with how the house feels to live in. Here are some reasons why this happens. You will of course want a home that is comfortable, relaxing and pleasant to spend time in. Getting your décor right can really help with this and can improve those factors. Think about using interior design tips that add feelings of comfort and make the house more inviting to live in. A useful and relatively inexpensive idea is to install wooden shutter blinds in the living room, kitchen, bathroom and the bedrooms. They not only help to provide some extra privacy but also make it simple to control the amount of natural light that comes into a room and will also help to keep heat in during colder weather and heat out during hot spells. As well as being comfy, you also want décor that helps you to relax. Getting this right can make a huge difference to your home, giving it a kind of laid-back feel. Many interior designers now bring nature back into properties to achieve this. Think about using flowers in pretty vases or houseplants to create a tranquil, calming feel in your home. Another way that the right decor can lift your home is by creating a feeling of more space. A more spacious feeling home will also have a lighter, airier atmosphere which is better to live in. Mirrors are the classic way of achieving this as they reflect light around the room to give an illusion of extra space. Many designers will use more than one mirror in a room to get the reflections bouncing around to amplify this effect. It is now widely accepted that the colors you have in your home will greatly affect the feel it has and your own mood. Different colors provoke different feelings in the human brain which then has an impact on how we view what is around us. In the case of interior design, this makes what paint colors you use or the choice of wallpaper very important. For example, some people will go for tranquil blues in the bathroom and energizing yellow in home offices to get the feel they desire. If you would like to lift the feel of your home to a truly luxurious level, then the small details are key. High-end furnishings are essential so make sure you have the best bedding, stylish throws and beautiful rugs around the home. Also pay attention to hanging stunning artwork on the walls and make sure the big pieces of furniture you have, like the sofas, really hit the style mark. All this will help to lift the feel of your home to the next level of style and sophistication. The feel in your home will be entirely fashioned by what you put in it and how you decorate it. The above points illustrate just why that is the case and what impact your décor has on the ambience of your living spaces. If you are looking to really lift the atmosphere within your house, then updating your interior design is the best way to go about it. The good news is that it does not have to cost lots of money to make great improvements.